In case you missed this dropping yesterday… Bless The Gym and FuBarbell are on a mission of spreading the good word of Olympic-style weightlifting. Kendrick Farris (@kendrickjfarris), 2x Olympian, and I (@dianefu) put our heads together and decided to come together and unite our coaching talents. For this one time only, we will be packaging this experience together for you into a 3-part workshop held at Jason Khalipa’s (@jasonkhalipa) NorCal CrossFit in San Jose, California. Come join us from 6/8/14-6/10/14 for this once in a lifetime experience! 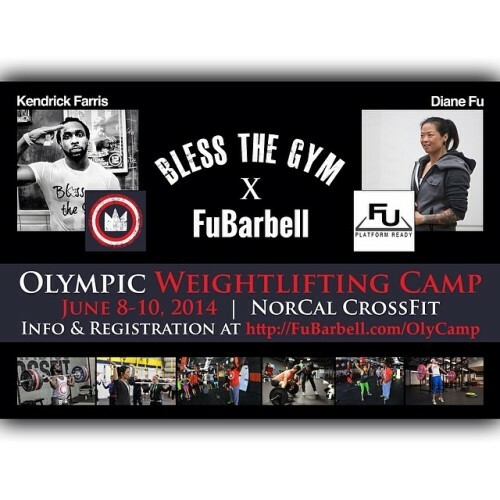 Bless The Gym and FuBarbell are on a mission of spreading the good word of Olympic-style weightlifting. Kendrick Farris (@kendrickjfarris), 2x Olympian, and I (@dianefu) put our heads together and decided to come together and unite our coaching talents. For this one time only, we will be packaging this experience together for you into a 3-part workshop held at Jason Khalipa’s (@jasonkhalipa) NorCal CrossFit in San Jose, California. Come join us from 6/8/14-6/10/14 for this once in a lifetime experience!